Oval engagement rings are back! The simple classic elegance of the old-fashioned oval engagement ring is the latest trend. Women love this style as much for its flattering shape as for its old-world charm. The right stones and settings can enhance the beauty of the hand. An oval shape encourages the eye to follow the long line and makes the fingers appear slimmer. This look is prized even by very slender women. Many engagement rings have a central stone flanked by two smaller side stones, often in contrasting colors. The side stones attract attention and add to the slenderizing look. They can be oval, round, half-moon shaped or even heart-shaped. You can also find oval stones in a halo setting, completely surrounded by tiny contrasting stones. Another type of surround with a starry effect is called a cluster. A proper oval cut stone should have a 1.5 to 1 length-to-width ratio. If the stone is cut much longer than that it will show a “bow tie”, a dark area which distracts the eye. An oval gem should look vibrantly alive in natural light. Oval gems are also set sideways in rings. This is sometimes called an east-west style or Edwardian style. Instead of being held in place with tiny prongs, the stone is embedded in the ring in a holder called a bezel. This is an older look, and less delicate than strong and sturdy. It is often used for men’s engagement rings, but many women prefer it since the stone is less likely to get caught on things. East-west ring settings for women often have exquisite filigree bands. Oval stones can be precious or semi-precious. They can be birthstones or any stone with a personal meaning. Some stones will give the engagement ring an antique heirloom appearance. Others will make it look timelessly classical. The metal used for the setting and band is also important. Yellow gold emphasizes the antique look of the piece. White gold, silver or platinum focuses attention on the stones. Rose gold looks feminine and romantic. Do you want a plain band so that all attention is focused on the stone, or should the band be decorative? Filigree bands and settings were very popular in Victorian and Edwardian times and are still used for both lengthwise- and sideways-set oval engagement rings. Tiny stones called pave stones embedded in the band look dazzling. Some very expensive rings have two or even three bands of pave diamonds. You don’t even have to have any kind of gemstone at all. A simple band of fine gold or silver with an oval filigree decoration is not only less expensive, but extremely elegant. While oval cut gems have been around for hundreds of years, the oval cut for diamonds was invented in the 1960s. It was designed by Lazare Kaplan, whose pioneering work in ethical standards for the diamond trade are well known worldwide. Oval cut diamonds are an elongated variation of the brilliant cut. The stone is cut with over fifty small and large facets, the better to reflect light. An oval brilliant usually has 56 facets. You can expect to pay anywhere from a thousand dollars to a hundred thousand or more for a high quality diamond oval ring. Diamonds can be found in every imaginable color. Pale yellow and green diamonds were popular in Victorian times and look lovely in a filigree setting. Some colored diamonds are extremely rare and expensive, while others are cheaper and look just as lovely. The most common and probably the least expensive diamond color is a rich amber referred to in the trade as champagne. In the enchantingly haunted world of “Twilight” the vampire hero Edward Cullen pledges his troth to his mortal love with an oval engagement ring. But instead of a single small oval stone, he gives her a shimmering domed array of thirteen white diamonds in a gold oval setting. In the story this ring came from his mother who had lived in the late nineteenth century. Conceived by Infinite Jewelry designer Shelli Ashton and designed by Stephenie Meyer herself, the ring was meant to evoke the Victorian era when most rings had rows or circles of diamonds and other jewels rather than solitaire settings. Diamonds were less expensive and more plentiful at that time owing to newly discovered diamond mines in South Africa. Creating a Twilight engagement ring was originally an idea of Ashton’s in 2008 after reading “Eclipse”. When she contacted Stephenie Meyer for permission Meyer sent her sketches of her own ideas to work from. The original ring in the book was made with yellow gold but Ashton received permission from Meyer to use white gold instead. The ring was released to the Web on June 18, 2008. Many couples have used the Twilight engagement ring as their own since that time. Now that the film version of “Eclipse” is out in theaters, interest in the ring should be renewed. Faithful replicas of the Twilight ring in diamonds and 14k gold sell for a little under two thousand dollars. Inexpensive copies using cubic zirconia are also available for as low as $35. Engagement rings need not have any diamonds to be both valuable and pleasing. Diamonds have not always been used for engagement rings. In fact, they did not really become a part of wedding tradition until the 1930s. Not everyone wants diamonds, even if they can be assured of the stone’s cruelty-free origins. Also, the prices for even the simplest diamond and gold rings can be extremely high. $2,000 to $4,000 for a plain oval diamond ring is not unusual. If you can’t afford it, don’t begin your life together by assuming a huge debt that will put a strain on your marriage. Contrary to popular belief, you are not required to spend two months’ salary on a ring. There is no rule as to how much you must spend or what the ring must look like. The most famous engagement ring before “Twilight” was probably Princess Diana’s, a large oval sapphire. If you want a stone that looks like a diamond look for oval-cut cubic zirconia or moissanite. Moissanite has a similar composition to diamond and is even substituted for diamond in scientific research. Once cut and polished it is indistinguishable from diamond and costs about one sixth the price. A three-stone moissanite ring can cost as little as $700. The same ring with diamonds might be well over $5000. If synthetic jewels don’t appeal to you consider highly polished semi-precious stones cut to a faceted oval shape. The gorgeous colors can reflect anything from the color of the wearer’s eyes to a traditional or personal meaning. Aquamarine is an excellent choice as are morganite, opal, tourmaline, amethyst, topaz and peridot. Such a ring might only cost about $300. You might be able to have a “Twilight” style ring made with these jewels instead. Turquoise ovals are another wonderful and often-overlooked choice. Perhaps the most unusual and eye-catching engagement ring is a band with four or five oval gemstones in a row. It’s called a multi-stone band and it looks even more exciting when five different gemstones are used. This type of ring was popular in ancient Rome and can sell for as little as $40 today. If you can afford to have a ring personally designed, consider a multi-gemstone ring. You could choose colors that tell the story of your love. Go to an independent local jeweler instead of a big store. Tell them you want an oval engagement ring, explain how much you plan on spending and see what they can offer you. If you really want diamonds, this is a good way to get them at economical prices. Don’t overlook Costco or K-Mart. Their supply comes from the same wholesalers as the big jewelry stores and costs about half as much. If you want to shop online, start at www.antiquejewelrymall.com and www.jewelrycentral.com. 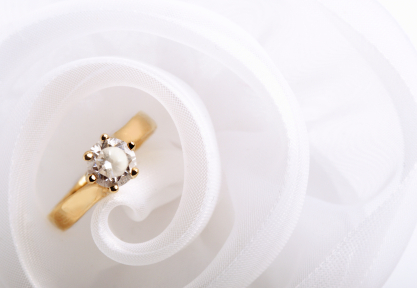 Second-hand rings are much less expensive than new ones. A lovely heirloom from out of the past might be waiting for you at an antique shop or estate sale. Old rings should be taken to a jeweler, where they can be cleaned, polished and assessed as to their real value. If the stone is right but the setting is not, you can have it reset. This is another way to get beautiful diamonds for less money, as well as other gems. New Age and pagan beliefs advise caution regarding leftover vibrations on used jewelry. If you are worried about this, light some sage in an incense burner and suspend the ring above, so that it is bathed in the cleansing smoke. You can also have used rings blessed by a priest or priestess of your faith. Speak to the spirits of the previous owners, wish them well and thank them for their gift. Here are a few words for the lady or gentleman planning a proposal. An old-fashioned surprise proposal with a ring of your choosing is risky, but can tell your love how well you know her. Listen to what she has to say about jewelry. Look at her jewelry collection. She may sense your intentions and begin casually pointing out rings she likes. Tell her friends and family what you have in mind and take their advice. If you have an heirloom ring in your family, as Edward did, think about presenting her with that when you propose. Or you can simply give her a token ring and tell her you want her to choose her own engagement ring. This shows that you respect her decisions and want her to be in control. This way she gets to pick out your ring, too. Choosing rings together can be extremely romantic. The emotional value of an engagement ring far outweighs the material price. The choice of stone and setting should always be what will best please the woman who is to wear the ring, since hopefully she’ll be wearing it for many years to come.